Il giardino dell'orticoltura - FLORENCE LIVE! In 1852, as the art of gardening began to grow in popularity, the Accademia dei Georgofili appointed a special commission to form a horticultural society in Tuscany, a process which necessitated the setting-up of an experimental garden. Such a garden eventually came into being in 1859, the year in which the society was granted permission to use a tract of land outside the San Gallo gate at the beginning of Via Bolognese, owned by the marquis Ludovico Ginori Lisci and the marchioness Marianna Venturi. After three years of preparatory work the Società Toscana d'Orticultura was in a position to begin using the garden for its botanical experimentations: a planting ground, vine and apple orchard were duly laid out and rare ornamental plants introduced in the area down on the city side. 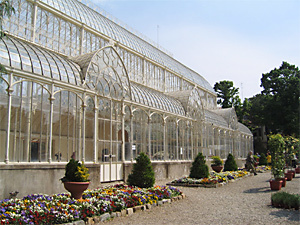 A radical reorganisation of the garden was begun in 1876, the main aim of which was to turn the site into a venue for national horticultural shows and other major flower exhibitions. 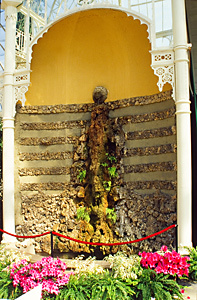 In 1880 the Italian Horticultural Federation organised the first National Flower Show and to mark the occasion, the Società Toscana d'Orticultura decided to add to the garden a large tepidarium, the likes of which had never been seen before in Italy. A subscription was launched among members to raise the funds needed for the new construction, whereupon engineer and architect Giacomo Roster was commissioned to draw up the plans, which were then executed by Officina Michelucci of Pistoia. The society's promotional activities were extended further by its hosting of another major exhibition in 1887, for which occasion the garden was enhanced with a new Café Restaurant and a second hothouse from the Demidoff Garden of San Donato. 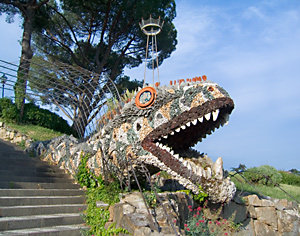 In 1911, the garden was once again the venue for a major exhibition, which was part of the city's celebrations of the fiftieth anniversary of Italian unity. Considerable changes were made to the garden in preparation for this show, some of which survive to this day, including, for example, the construction of the Bondi loggia by the Manifattura di Signa. World War I marked the beginning of the slow but relentless decline of the Tuscan Horticultural Society. In 1930 the garden was purchased by the municipal authorities and turned into public gardens. Roster's large tepidarium had fallen into a serious state of disrepair, and between 1933 and 1936 the city set up a special fund for its restoration. The tepidarium, which subsequently suffered further damage, especially during the Second World War, has recently been restored once again.